and even some early readers to be able to read. My first impression was 'wow that's a lot of prayers', it is almost a Bible worth of prayers for children, it's thicker than any children's prayer books I've seen before, but what they have done is compiled prayers and perhaps prayerful quotes from people through the ages. Some of the prayers are scripture in simplified language also. I guess it could be viewed and read like a book of poetry? I'm not sure? Or just read through it like a book? The prayers are not just for bedtime but there are prayers to praise God, prayers for family and friends, prayers for mealtime etc. For training children to think of God in every circumstance, this is excellent and perhaps this book could be used throughout the day? Though one would have to be very organized to have it at hand. I like the concept of it in teaching children how to talk to God. I think that is important and for that reason I will give this five stars. As to the practicality of it, I can see it being used at bedtime and I guess the fact that not all prayers are 'bedtime' can be overlooked? 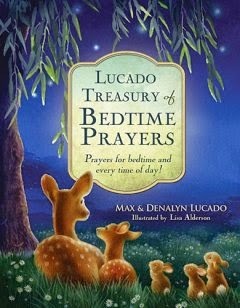 It's not really a Bedtime Prayer book as the title suggests, it's more a Prayers book for children in my opinion. Please note Booklook sent me a copy of this book to review however the review and opinion is entirely my own.